Note: The following guidelines are considered general, and as such, some situations may require subtle deviations from these guidelines. Please discuss with a doctor or physiotherapist for more information about using canes or crutches for specific condition. Canes and crutches are some of the most common gait aids. They have applications with all age groups and can be used in a variety of ways to assist with certain conditions, but there are some general tips that are fairly applicable across the board. We will highlight these below, but we will also try to keep it brief, leaving you with the most important information. For more details or information about using gait aids for your particular condition, we encourage you to chat with a doctor or physiotherapist. 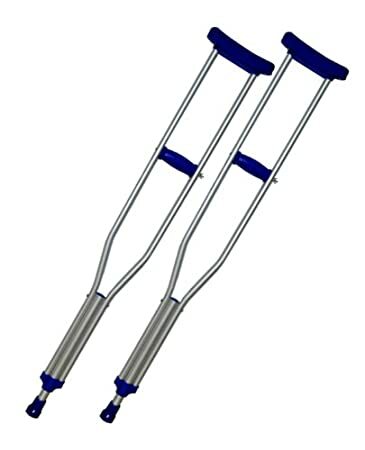 These are by far the most common types of crutches. They have the armpit pads, the wider upper portion with a horizontal bar for grip, and then narrow to a single point on the ground. Crutches are usually used when a person cannot bear their full weight when standing under gravity. In this case, crutches can be used to offload some of that weight and can also provide some more stability. Crutches and walkers are the only gait aids that you can use if you have a limb that needs to be completely offloaded. For example, if you have a broken or severely sprained ankle, or are recently post-op, and are considered to be of ‘non-weight-bearing’ status, then crutches will likely be the first option. Many axillary crutches come with heights listed on the bottom pegs where you can adjust the main height of the crutches. This is a great starting point. Have the crutches a little out from the body, rather than straight down. For example, if you have the crutches at your sides, they should be toughing the ground about 6 inches away from your foot. This is definitely counter-intuitive, but the armpit pads should NOT go directly underneath your armpits. This is because there are lots of important nerves and vessels traveling through the armpit area, and if you are constantly putting pressure on the area you could damage these important nerves. Therefore, have the pads about 3 finger breadths down from the armpit along the side of your chest. Now that the heights of the crutches are adjusted, you can adjust the levels of the handles. If you stand with your crutches and let your arms relax, the handle should be at the level of the wrist crease. This will help ensure a slight bend in the elbow when you are using the crutches, which is the strongest and most stable position. Forearm crutches are also relatively common, but not as common as axillary crutches. They are more slender and allow for more use of the hands, for example if you need to open a door, but they are a lot more difficult to learn, so they are usually reserved to people who will need them for a long time. Children are often given forearm crutches because they can learn them so quickly, they allow them to get around faster than axillary crutches, and if they’re going to be using them for a long time they may as well have something more convenient. Generally speaking, forearm crutches are much more difficult to learn and become natural with, so given that their advantages may take a little while to appear, they are usually reserved for long term conditions. For the short term, axillary crutches are often a better option. Please follow the guidelines listed above for axillary crutches. There are only a couple additional points to consider, which we listed below. The forearm cuff should sit a couple finger breadths below the bony part of the elbow. When standing with the crutches, the elbows should be bent to about 30 degrees for maximum strength and stability. Be careful when selecting forearm crutches over axillary crutches, as forearm crutches require more balance as well as strength from the upper body. While crutches can be really effective for unloading body weight without compromising stability too much, canes on the other hand are not meant to offload a lot of body weight. Generally speaking, canes have the ability to offload about 10-30% of body weight, but placing any more weight than that through the cane can be highly dangerous. Canes cannot be used if you are told to be non-weight-bearing on one foot. Even if you use two canes in a similar manner to crutches, the design simply does not allow for total offloading of a limb, and are therefore best used in cases where you just need a bit of extra balance. They can increase the base of support in order to enhance balance, but a cane will also improve proprioception, which is the ability to detect all body part positions in space, which is similarly crucial for balance. There are a variety of cane styles, but the most common are standard canes and quad canes, where quad canes simply have four “feet”, as opposed to one single point. A quad cane will offer more stability, but it’s a little bigger. Overall, canes are great for those who need a little help with their balance, but otherwise have suitable muscle strength to allow them to get around. Also, given they don't offload too much bodyweight, they are more reliable for those who do not have an injury requiring off-loading. these factors combined make them popular options among older individuals who need a little extra balance support and confidence when getting around. This may seem surprising to some, but a cane should actually be used on the strong side of the body, assuming one exists. For example, if you have an injured right leg and you need to use a cane to get around, the cane should be on your left side. Of course, this won’t be possible if your left arm or wrist is also injured, but the strong side is the ideal location to start with. The cane should be adjusted to a height where the handle will reach the wrist crease when the arm is relaxed hanging down by the side. For quad canes, the two feet on one side of the cane will stick out further than the feet on the other side of the cane. The feet that stick out far should be on the outside so that you don’t trip over them. When first learning, stay focused. It will be easy to get the hang of it quickly and overestimate your familiarity with this new walking style. Don’t risk re-injury for the sake of trying to go too quickly. Watch for different surfaces! Remember that the points coming into contact with the ground usually have some type of rubber coating. This can become slippery if it gets wet, so going from the outside on a rainy day to a tiled floor can be really dangerous. Please try and remember to give them a quick wipe before using them inside in this type of situation. Walking with a canes or crutches will naturally require more involvement from the upper body. This may go unnoticed at first, but prolonged use can lead to upper body fatigue and potentially damage if you are not careful. Try and take breaks whenever possible, especially when you are first getting used to the crutches, and monitor for any signs of irritation or injury. Do NOT use the cane or crutches for leverage when going from sit to stand, or vice versa. They can slip out from underneath you, which can result in a fall. Instead, if you have two crutches, hold them both in one hand, stand up with minimal assistance from the crutches, and then once you are up you can use them for stability. When you are prescribed with a cane or crutches, or when you go to pick them up, ask about potential progressions down the road. You can facilitate your recovery by striving to mimic a normal gait pattern, so including this in your progression can go a long way, but should be done on the advice of a doctor or physiotherapist. All the information about the different gait aids is fairly general, but nevertheless, is often misunderstood. For example, most people would not realize that they should not place the armpit pads of axillary crutches directly under the armpits, even though this can save a lot of trouble in the long run. Additionally, our tips on how to fit a cane or crutches are also quite brief, but in reality, that information should really cover everything you need to know about fitting these devices. If there is one take-away message from this article, it is that gait aids can be extremely helpful, but need to be fitted properly and used with caution. The latter point is especially important, as you may be completely confident in your ability to use a gait aid in a certain situation, but may be surprised when the situation changes unexpectedly. Just be careful, listen to advice from your doctor or physiotherapist, listen to your body, and you should be well on your way to mobility!